If you have a sunny position, a well drained soil and are willing to prune it, Lemon Verbena is easy and rewarding to grow. If you are looking for lemon fragrance, the the herb Lemon Verbena is the one for you. It has a distinct and strong fragrance which is intensifies when rubbed against, crushed or picked. This is the herb used in teas and perfumes as well as in many natural medicines. For most, the taste of the leaves is a little to strong, and for the strongest flavour, pick it just as it begins to flower. This is an easy plant to grow as long as you do not get very heavy frosts, in which case you can grow it in a container and bring it under cover. A well drained soil is essential, wet soggy soils will kill Lemon Verbena fairly quickly. The second factor is sun, this is aplenty that requires a sunny position to thrive. Soil needs to be humus rich, however not over fertilised. You also need to prune this plant, immediately after flowering prune it back to the lowest good green growth you can, but not to bare stems. You may need to do this three times a year. Simply use sharp secateurs to prune back to just above a leaf node. Regular pruning is best as the plant tends to send out new growth from just below where it is cut. Leaves can be dried by hanging bunches upside down in a cool dry well aired position. Once dried the leaves can be removed from the stems and stored in an airtight container in a dark position. You can grow Lemon Verbena from cuttings taken in late spring to early summer. They can be planted into potting soil with a cloche over the pot to increase humidity, or they can be struck in water. 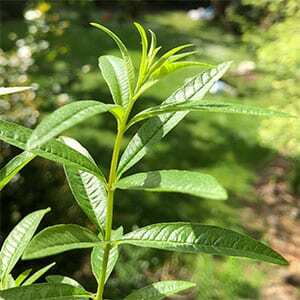 Common Names – Lemon verbena, Lemon scented verbena. Soil – Well drained, humus rich. Height – To around 1 – 2 metres. Spread – To around 1 metres. Flowers – Small and white with purple as terminal bracts,. Foliage – Mid green and fragrant.